Enhanced Audio and Bass Response, Crisp Treble, Natural Alto, Deep Bass. It makes you feel you are personally on the scene. Integrated Multi-point Technology: it can simultaneously connect two smart phones. So you can seamlessly switch between your business and personal phones. Multi-functional Button: Supports hands-free call, voice prompt and number reporting. Supports answer and end a call with "yes or no". Supports vibration for incoming calls and last number redial. 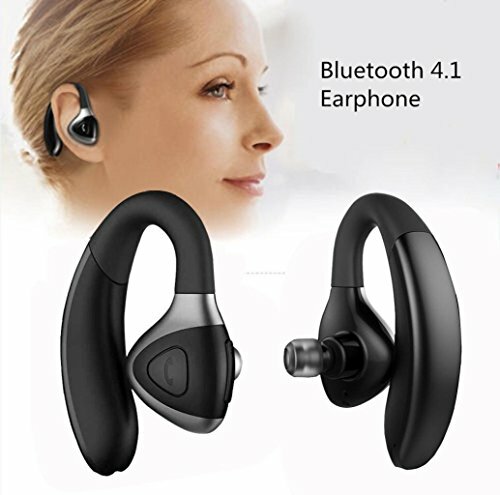 Endurance Time: Built in two rechargeable Grade A polymer 165mAh battery, it provides up to 10 hours of continuous talking time, 10 hours of music time and up to 500 hours of standby time. Low power consumption, Supports low-battery warning. Suitable Occasion: Its lightweight, comfortable, and easy to carry and custody. It's suitable for driving, business, traveling, ect. Compatible for Apple iPhone iPad, samsung, HTC, LG and other mobile phones. Lightweight and comfortable,easy to carry and custody. It's suitable for driving, business, traveling, ect.